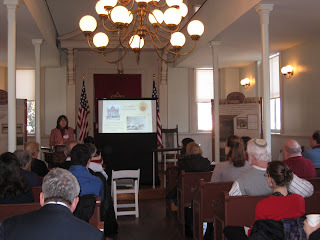 Today we hosted a Lunch & Learn talk in our historic synagogue featuring Jewish life in Mr. Lincoln's City. The talk centered around daily life for the some 2,000 Jews living in DC and Old Town during the Civil War. Wendy Turman, our archivist, joined me in telling some of the colorful stories associated with personalities like Judah P. Benjamin, Confederate spy Eugenia Levy Phillips, and Medal of Honor recipient Leopold Karpeles. 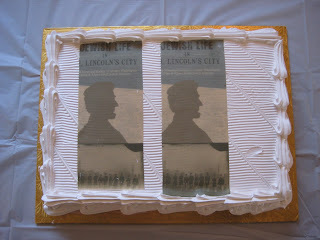 Birthday cake was served to all in attendance. This is the first in a series of programs to celebrate the sesquicentennial of the Civil War. To learn more about Civil War programming, click here.